In Quill, thirteen-year-olds are categorized as Wanted, Necessary, and Unwanted. The Wanteds attend university, the Necessaries do manual labor, and the creative Unwanteds are sent to their death. When Alex Stowe is sorted into the Unwanteds, he must leave behind his Wanted twin brother Aaron. What Alex and the other Unwanteds find at the Death Farm is a secret world called Artimé, full of magical creatures and new outlets for their creativity – dancing, drawing, acting, and singing. With the two societies existing so closely, it is only a matter of time before there is a showdown between the magical weapons of Artimé and the military strength of Quill, with the brothers divided. Lisa McMann’s first foray into middle grade books has many features that will appeal to younger readers. Alex and his Unwanted friends are well-developed and likable. I enjoyed that they were flawed and all of their choices had consequences. McMann strikes the right balance in portraying complicated family relationships, particularly with twins. The highlight of THE UNWANTEDS is the way that the arts are used as weapons, such as the imaginative “slash singing, slam poetry, and fire steps”. My favorite parts of the novel involved the students learning about the arts, such as discovering music or creating fire-breathing origami dragons. At 400 pages, it is not a short novel and I wish there had been more scenes with the students in their classes and developing their powers. I was also concerned that there seemed to be a message that creativity exists only in the arts, while the children who liked math and economics were not seen as creative. As an adult reader, I realized that the reason Aaron was a successful Wanted was because he was creative, but this point may not be clear to middle grade readers. Kirkus called it “The Hunger Games meets Harry Potter,” which I believe does a disservice to THE UNWANTEDS. Readers who pick up this novel expecting it to be The Hunger Games will feel manipulated by the lack of similarity between the two. Likewise, readers who want this to be a Harry Potter novel will be disappointed when it doesn’t measure up. THE UNWANTEDS is an enjoyable introduction to dystopian novels on its own and when I recommend it, I won’t mention either of those other titles. The characters are engaging and the world of Artimé is fascinating. ?????? ?????? ???????? ???????? ???????? The Unwanteds was an absolutely fantastic read. It’s very, very rare that I want to flip back to the beginning of a book after finishing and start all over again, but that’s exactly how I felt with this one. I loved the stark contrast of the dull, gray world of Quill compared to the vibrant, wonderful world of Artime. Honestly, I felt a little like one of the Unwanteds when I was first introduced to Artime. It was such a shock from the lifeless world of Quill. But, like the Unwanteds, I grew to love it. It was an amazingly beautiful and happy world that I started finding myself desperately wanting to live there as well! All the characters are fantastic. Alex was especially amazing. He grew so much from the innocent little 13-year-old throughout the course of the story and he had some majorly tough life lessons to learn. I really respected the way he dealt with all the difficult things that were thrown at him. All the other side characters were fantastic as well. Not only did they each have their own personalities, but they all had noticeable growth as well which I think is something you very rarely see. I especially loved all the fantastical characters like Mrs. Octavia and Simber. McMann does some seriously awesome world-building in The Unwanteds. Not only did she create to completely different worlds each with their own fantastical elements, but she also weaved multiple side-stories into the mix. Though I predicted a few of the outcomes, I was blindsided by many more. 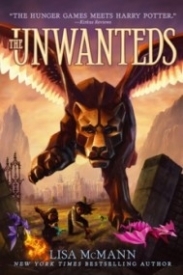 The Nutshell: I was enthralled the entire time I was reading The Unwanteds. This is definitely one book you’re not going to want to miss. This book has everything from magic to squirrelicorns to mystery to a suppressed society. If even one small thing about this book intrigues you, pick it up. I can almost guarantee you won’t be disappointed. Anyone who knows me well probably knows that I'm not a big fan of Lisa McMann. All of her prior books sounded good, but then were utter disappointments, largely because of the rather uninspired writing. I didn't even want to read this one, but felt compelled to because of its dystopian nature. Well, I am happy to report that McMann can actually write complex sentences. Hurrah! Now I am curious why she writes real sentences for a middle grade book, but not for young adult ones. Does she think teens will refuse to read anything that puts a subject and a verb in the same place? Ranting over. This was a really fun read, very much unlike any of her previous books, both in style and tone. There are some dark aspects, but, for the most part, this is a story of a magical world that any kid would love to live in. I mean who doesn't want to go to a school where your room is made for you and full of stuff you love, where you can travel anywhere by tube, where you can eat whenever you want, where you take classes only in the arts and where you get to learn magic spells? I would still prefer Hogwarts, but Artimé is pretty cool. My favorite character by far was Lani. She walks everywhere with her nose stuck in a book...what's not to like? Most of the others I didn't particularly bond with, but they were interesting. Actually, the one I disliked the most was Marcus Today, founder of Artimé. The problem is just that he kind of creeped me out, although I'm not really sure why. I think he reminds me a little bit of Willy Wonka that way. The dystopian elements are pretty minimal, mostly just in the first chapter or two, so if that's what you want, you probably be disappointed. If you're looking for a fun story that glorifies the arts or you just love stories of magic, give this one a try, even if, like me, you were unimpressed by McMann's previous efforts.